Below is the roundup of Camino-related events and hikes in the SF Bay Area for the month of November. Tickets are available for the nationwide screening of I’ll Push You, an inspiring film about two best friends on the Camino de Santiago. There will be screenings all around the Bay Area and country, so check with your local Camino group to join pre-film gatherings. Purchase tickets. Oakland’s Jack London Square screening, 7:30 p.m.
To watch the film in Oakland at Regal Jack London Stadium 9, purchase movie tickets here. Plank doesn’t take reservations, so just find an open table. Bring cash to split checks, or run your own tab. RSVP not required, but if you are on the NorCal Facebook group, check the event to see who’s coming. Happy Hour specials from 3-7 p.m. $2 Off All Drinks & Appetizers. See Happy Hour Menu. Also, see Dinner Menu. Saturday, November 4, 10:30 a.m. – 12 p.m.
October 2017 Lake Merritt Walk. Extra credit for Abigail for doing a lap around Lake Merritt before this walk for a fundraiser for Oakland schools. And for her fabulous Ta-Da! pose! This is an informal gathering that takes place on the first Saturday of the month, rain or shine. The group meets at 10:30 a.m. at the Pergola on the east side of Oakland’s Lake Merritt and starts walking promptly at 10:45 a.m. It’s a level, 3.3 mile walk around the lake that takes about an hour. All are welcome (American Pilgrims members and non-members). Afterwards, there is an optional coffee stop. Directions to the walk: Take BART to the 19th Street Oakland station (Lake Merritt station will be closed this weekend) and navigate your way to the Pergola. If you drive, make sure to give yourself enough time to find parking, as there are many activities on Saturday mornings in the Lake Merritt area. If you are in the Bay Area, join the Peregrinos Northern California Facebook Group to get details on this and other events. Saturday, November 11, 10:00 a.m. – 3:00 p.m.
Help the Northern California chapter celebrate this year’s returning pilgrims at our annual Welcome Home Potluck. We’ll be gathering at St. Augustine Catholic Church in Oakland, near the border with Berkeley. This year’s theme is Beyond the Camino francés and we hope to inspire you to think about Camino routes other than the most popular and well-traveled Camino francés. Please refer to the American Pilgrims – Northern California Chapter page for more information, event updates or cancellations. Sunday, November 26, 2017, 10 a.m. – 6 p.m.
For those who need to burn off some Thanksgiving calories, or simply want to train for the Camino, I recommend this hike led by Richard Duker, one of our NorCal APOC chapter steering committee members. I had some of my best Camino training hikes with Richard, who is also a trained Sierra Club hike leader, Hospitalero, and US Army veteran. This hike is not for wimps or whiners, so make sure you are prepared to walk 12 miles! Also, you must be a current American Pilgrims on the Camino member. The hike will be moderately paced, mostly on flat pavement, from the San Francisco Ferry Building to the Sausalito Ferry. Be advised that there is a steep uphill path to the GG Bridge and a steep downhill road. We will return to San Francisco on the 5:35 p.m. ferry (bring a Clipper Card). 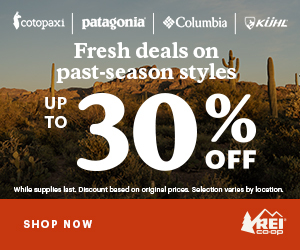 Because the hike is 12 miles, it is recommended for experienced hikers who have done at least three 8-10 mile hikes recently. Open to current American Pilgrims members. Click here to join. Here are a few more posts about my pre-Camino days in A Coruña and Ferrol. Follow this blog and check Camino Inglés Stages for updates. I have been sharing photos from the Camino Inglés on Instagram too! Follow Instagram.com/caminoprovides. 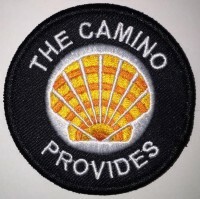 The patch is similar to the 2017 design with the rainbow-banded Camino shell, but has the red color for 2018. The rainbow shell design was inspired by the concept of chakras, which was an important part of my journey with yoga and healing over the last year. I am continuing with the chakras theme for 2018 by highlighting the root chakra color at the base of the shell. Learn more.